If the chat widget isn't appearing on all of your pages, or if your chat widget is no appearing for all contacts who meet your target audience criteria, review the following settings. In the bottom left corner, click Inbox Settings, then select Chat. Click Copy to copy the code and add it your website, or enter an email address to send the code to your web developer or IT resource. Please note: if you already have the HubSpot tracking code installed on your website, or if your website is hosted on HubSpot, you do not need to install this code snippet separately. To the right of the inactive chatflow, in the Status column, click to toggle the status switch on. Hover over the chatflow you want to edit and click Edit. On the left, click the When tab. Ensure that the website URLs for your chatflow are correct. This setting allows you to pick which pages show the chatflow. If you set specific URLs here, the chatflow will only appear on these pages. If you would like the widget to appear on all of your website pages, add /* to the end of your domain (yourwebsite.com/*). If you've selected is all pages, this only targets pages that are created in HubSpot and will not target any external pages on your website. Use another option, such as contains, to target external pages. Ensure that the query parameters for your chatflow are correct. 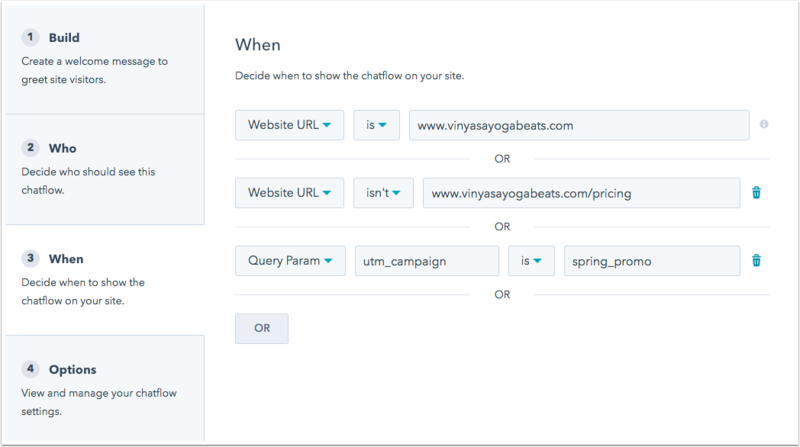 If you set specific parameters here, the chatflow will only appear on pages with this parameter in the URL. If you have decided to hide the chat launcher when no team member is online or when it is outside of business hours, your website visitors will not see your chat widget when they visit your website. This setting only applies to a live chat with no associated bot. Click Inbox Settings in the lower left corner, then click Chat. If your availability is based on your team member status, click the When all team members are away dropdown menu to change the chat widget's away behavior. 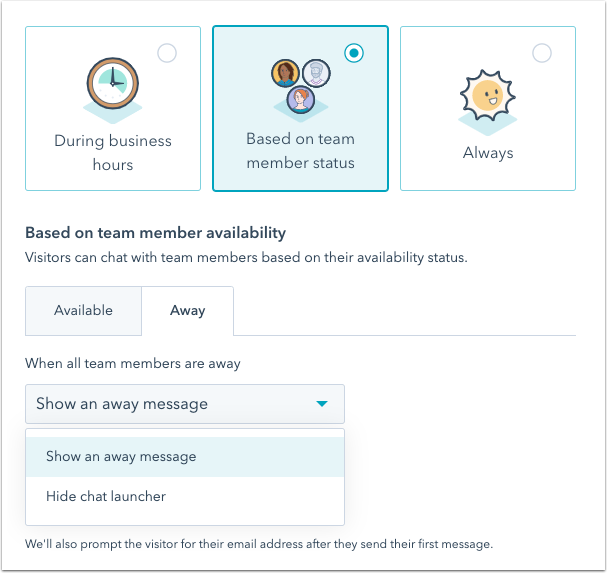 If your team is only available during business hours, click the If all team members are 'away' dropdown menu to change the chat widget's away behavior. On the left, click the Who tab. Confirm that your intended audience is selected under Show this message to. If you've selected a list in the Hide message from dropdown menu, make sure that the contacts you are targeting are not included in any of these lists. 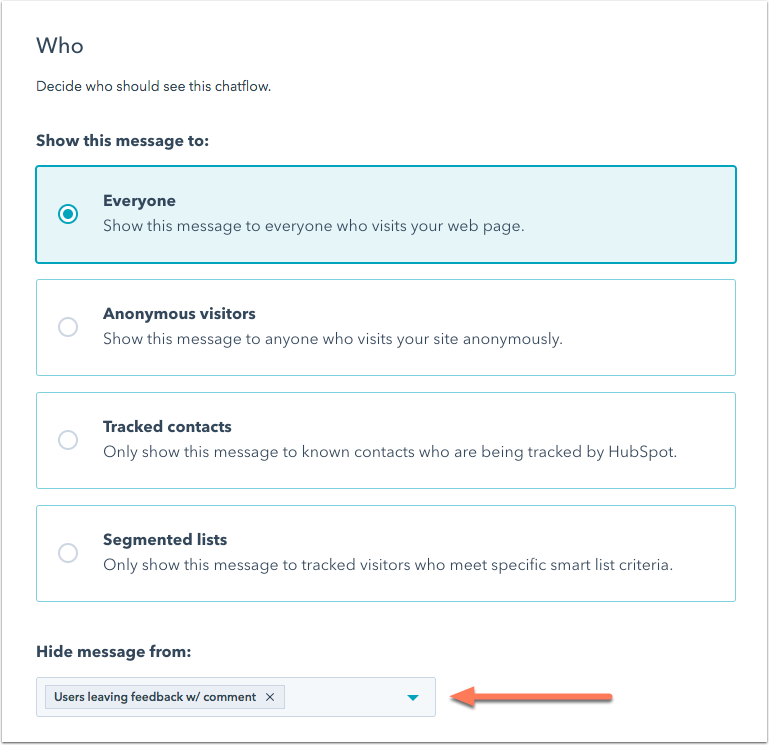 If after following the steps above your chat widget is still not appearing for the contacts that meet your audience criteria, this is most likely due to tracking cookies. For your chat widget to appear for a visitor, a tracking cookie must be associated with the visitor's contact record in your contact database. If the contact record does not have a tracking cookie, then your chat widget will not appear for the visitor associated with the contact record. How does a visitor get a tracking cookie? The visitor fills out a HubSpot form. The visitor clicks through a HubSpot Marketing email leading them to a HubSpot page or to a non-HubSpot page with the HubSpot tracking code installed. Until the visitor performs one of the conversions above, HubSpot doesn't know who the visitor is or what lists the visitor's contact record is part of. Therefore, if you have contacts that haven't converted yet, they won't see your chat widget even if they're a contact in your database or a member of the list you're targeting to. Please note: even if the visitor has done one of the two actions above to get a tracking cookie, if the visitor has since deleted browser cookies or visited your site in a different browser, in an incognito window, or on their mobile device, then their tracking cookie can't be detected and your chat widget won't appear for them. Why do I have contacts without a tracking cookie? The contact was added manually. The contact was created from a logged sales email. Once a contact in your database is tracked with a tracking cookie, then HubSpot considers them a known contact. If they meet your audience criteria, your chat widget will appear for them when they visit your site.